A vertical bar scale is pricked through and a horizontal bar scale is also pricked through and drawn in pencil. 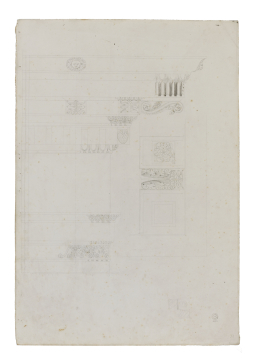 Neither of them correspond to an English scale and taken with the rather mechanical nature of the drawing it is probable that it is a copy made by Soane from an Italian source or (Professor du Prey, January/February 2009) purchased by him from a Roman source. Built 'close to 100 B.C.' (L.Richardson, jr, A New topographical dictionary of ancient Rome, Baltimore, 1992) or 'almost certainly in 484 B.C.' (Blue Guide, Rome, 2000). Three columns remain of a peripteral temple with eight colums at each end and eleven on either side.